A kitchen is the heart of a home. While it’s first and foremost a work area, the design and atmosphere of the kitchen set the tone for the entire home. 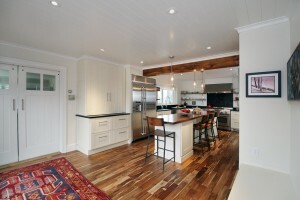 We recently had an opportunity to enhance the kitchen of Libby Kirwin’s house in Middletown, RI. 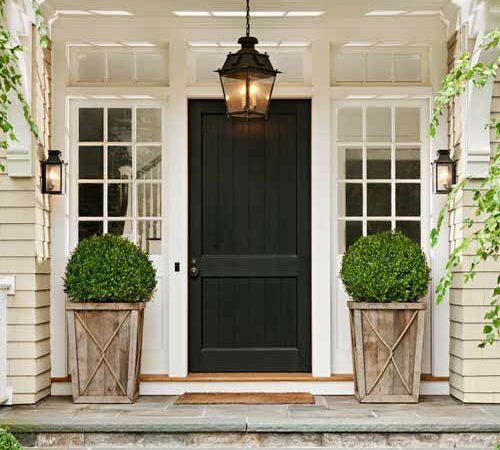 Libby is the owner and lead designer of Libby Kirwin Renovation + Design Consulting. 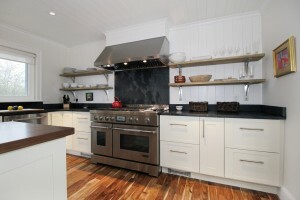 She loves to cook, so function was very important to her when planning this kitchen. 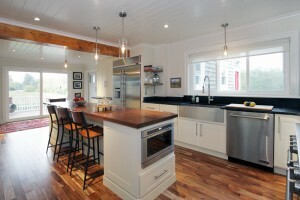 Plus, she wanted her kitchen to reflect her signature modern style. Griff Electric helped plan the lighting scheme to ensure work spaces were properly lit and gathering areas had softer lighting. We sat down with Libby to talk about the project. What elements of the kitchen are you most excited about? The house was originally built in the 1930’s and is located on two acres of farmland off Green End Avenue in Middletown, Rhode Island. It has a lot of character built into it. Our kitchen remodel added some modern conveniences and elegance. 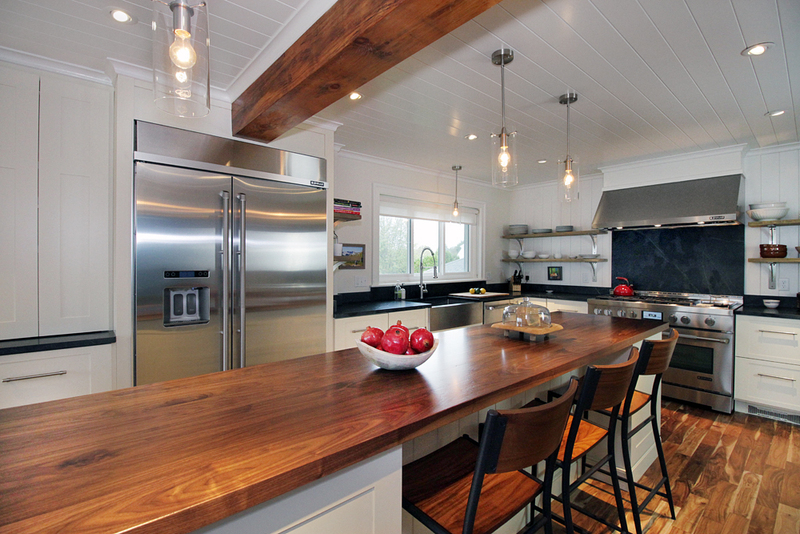 The upgraded counter tops and large island were a beautiful addition. 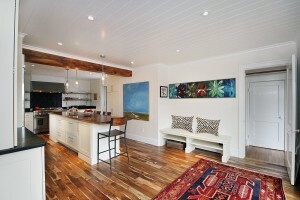 The modern light fixtures over the island compliment it well and add a focal point to the space. 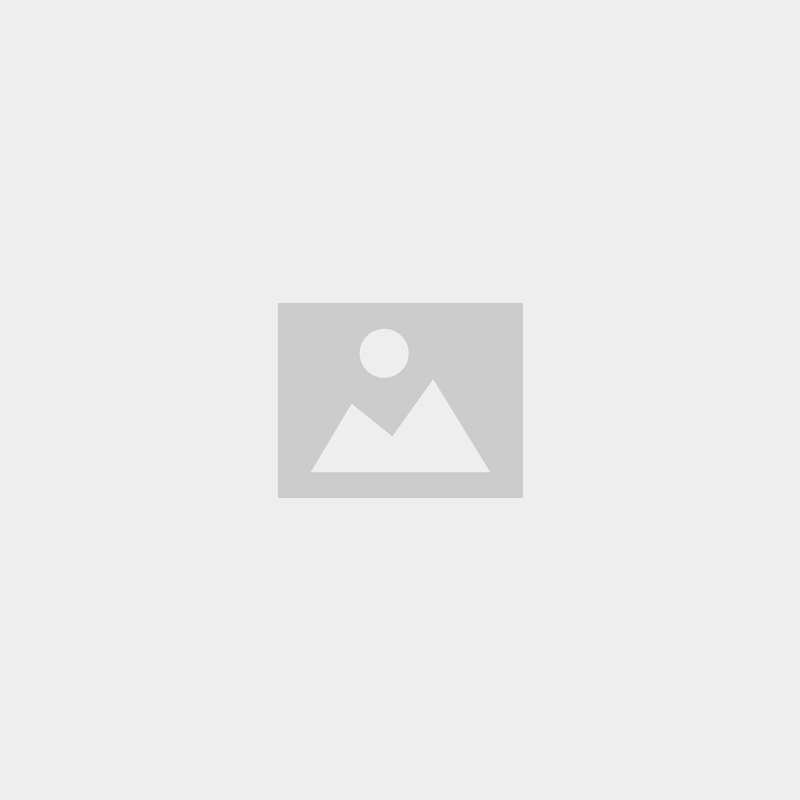 Were there any creative solutions Griff Electric designed? All the counter appliances are hidden away and plugged in. No more coffee makers and toasters on theses countertops! Sean [Griffths] designed the kitchen wiring to optimize the simple, elegant look we were aiming for. 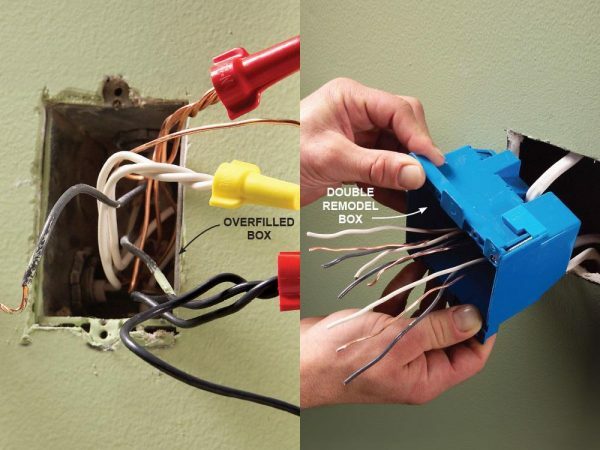 Most people don’t think of it, but the look of your kitchen depends a lot on where your outlets are placed! What were the challenges you faced with this project? One major challenge was we couldn’t order any cabinets until we gutted the entire kitchen. Having no storage during the cabinet process was difficult. The entire renovation also took about 8 months, but at the end of the day it went smoothly because of all the great planning we did. What was your goal for this kitchen design? We wanted to maximize the space. I also wanted to close off the preexisting bathroom and find a new entrance for it. Getting rid of that extra bathroom door gave more visualization and attention to the front of the house through the sliding barn door. Kevin Kirby, my husband, did an incredible job designing the layout exactly right. We wanted a modern kitchen but we also wanted it to blend with the classic farm house that it is. How did the lighting scheme impact the overall function of the kitchen? Griff Electric installed 4-inch Juno recessed cans with Kimball trims. We love them because they are directional picture lighting that can be used for anything. They can be pointed in different directions and are very functional and elegant. 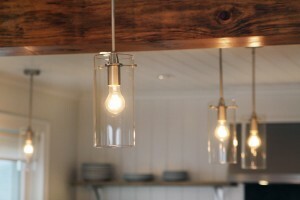 The pendant lights we installed give the kitchen a modern touch. I love to cook so to me it’s just as important that the kitchen is functional as it is elegant. The LED under cabinet lighting brightens the work space on the counter. What’s the most important thing to consider when planning a kitchen renovation? It’s best to plan the location of the appliances first (i.e. dishwasher and refrigerator). Think about how you will use the appliances, when you’re loading and unloading the dishwasher, for example, and make sure it’s convenient for you. 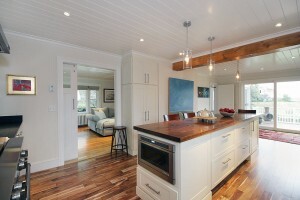 If you want a large island in your kitchen, pay close attention to the movement when you walk around. Make sure nothing gets in the way when doors and cabinets are open. Lastly, consider bright lighting in areas you spend the most time; over the sink or prep areas. 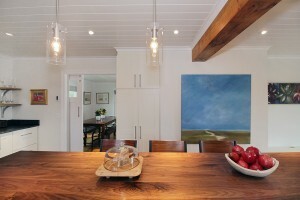 Recessed lighting around the dining area is ideal when you are trying to ‘set the mood’. There is a dimmer on every lighting fixture in this kitchen. Dimmers are a girl’s best friend! Photos by Melissa Quintal Photography. Visit Libby Kirwin’s website to view before and after photos of this property.